You’ve worked hard to shape and finish our paddle. Now it’s time to protect it. If you’re reading this, you’ve probably chosen to use traditional methods. Perhaps you find there’s nothing finer than the smell of linseed oil and the soft satin feel it imparts. More than likely you’re considering finishing or refinishing your canoe paddle with an oiled and waxed finish. At Ashes we’ve been coating our canoe paddles with a linseed oil and wax recipe from the beginning; partly for its lovely lustre, partly because we love its smell, but mostly because it aligns with our ethos of using materials of known provenance and sustainability. Linseed oil is old school. It’s been used for many many years as a component in linoleum, varnishes, paints and putty; and as a penetrating finish by furniture and tool makers, and for rifle stocks, cricket bats, and paddles. Unlike varnishes, linseed oil penetrates into the pores of wood where it hardens into a non-glossy surface. With multiple coats and hand polishing it’s possible to achieve a rich and deep finish coveted by sports-men and furniture lovers for centuries. There’s no way around it; patience is a virtue. So said, let’s get started. At Ashes, we start the process by sanding the blade, shaft and grip with 120 grit sandpaper. This leaves the wood pores open enough to absorb the initial application of linseed oil. The first coat should be generous and sit on the wood for no more than the time it takes for it to absorb into the open pores – 20 to 30 minutes maximum. For deeper penetration gently heat the surface of the wood. Once the excess has been wiped off, let the paddle sit for 24 hours. Failure to wipe off the excess at this point could well result in a sticky finish later. Wipe on second coat, once again ensuring that the coat is liberal enough to fill the pores. You’ll find that the paddle is still capable of absorbing plenty of oil. Once again, wipe off excess after 20 – 30 minutes and let harden for 24 hours. Repeat step two another 5 or 6 times, each time sanding with increasingly fine grit. At Ashes, we generally stop at 600 grit as anything further seems to trigger the law of diminishing returns. It’s up to you when to know when to stop. You’ll also know that you’ve applied enough coats of oil when you can observe uniform coverage after the drying period has passed. There will be no flat or uneven spots once you’ve got it right. The oil will continue to harden. Applying wax too soon may result in a sticky finish which you’ll have to go back and remove. It’s prudent to let the paddle sit for a week or two before protecting with wax. In the end, you’ll thank yourself. The finish you’ve achieved to this point is not waterproof (or even very water resistant). Water penetrates linseed oil finish after a few minutes of immersion; obviously not ideal for protecting a paddle. Linseed oil is also susceptible to mildew. If improperly maintained or stored a paddle owner may find their treasured possession mottled with black spots. Both the water and mildew issues can be mitigated by sealing the paddle shaft and blade with wax. Thus the need for Step 5. 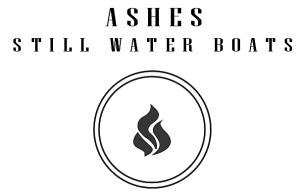 At Ashes we use a recipe made of mineral spirits, carnauba wax, and beeswax. The mineral spirits are a carrier, carnauba wax is exceptionally hard and sets the finish, and beeswax imparts a beautiful low lustre. There’s no need however, to concoct your own sauce. Commercially available paste waxes or automobile waxes contain similar ingredients, are well tested, and will seal the surface with equal aplomb. I’ll leave it up to the reader to choose the product which most closely aligns with the desired touch and look. Either brew up our recipe or purchase a wax of your own choosing. If you do choose to follow our recipe, melt the following ingredient at a low heat, slowly in a double boiler. The mix is flammable so BE CAREFUL. The result should be a soft, but not liquid, paste that can be rubbed onto the paddle’s surface. If the mix is too stiff when cooled go back and add more mineral spirits. If it’s too liquid, add more wax. In any event, once the mix is cooled, dip into it with a lint-free cloth; apply to the paddle, wait 10 minutes, rub off all excess, and then polish. And polish. And polish. Repeat the application a total of three times after which you’ll have built a thin protective layer, protecting against water and mildew. You’ll know you’ve got where you want to go when water beads tightly, and you no longer leave a fingerprint in the waxed surface. For now. Except an oiled and waxed paddle needs regular care to keep it protected against the elements. Keep out of direct sunlight except when using. If you follow these steps you’ll end up with a beautiful traditional finish, with a soft feel, and plenty of protection. Just remember; patience and continued care is required. And share this article at will. If you’ve got this far, perhaps you’re thinking that you can use the Ashes Paddle Wax recipe as a moustache wax; if so, you’re clearly a bright lad or lassie. Add an essential oil, evergreen perhaps or pine oil and you’ll leave your shop smelling great, and looking like the handsome gent you most obviously are.